Long Bay Beach Club introduces new villa ownership concept. Staying in a beachfront luxury villa with family and friends is a vacation option that is growing in popularity in the Turks & Caicos Islands. The combination of comfort, privacy, and versatility—along with enjoying the most beautiful beaches in the world—is an attraction that’s hard to beat. Long Bay Beach Club is a unique opportunity to enjoy a holiday that combines five-star resort-style amenities in a newly constructed, contemporary designed, five-bedroom villa overlooking the sparkling turquoise waters of Long Bay — year after year — for a fraction of the cost. It also offers potential property owners a fantastic chance to “get their feet wet” in more than the sea. Each 5 bedroom villa includes a private infinity pool, deck, and fire pit. Long Bay Beach Club (LBBC) is an enclave of three private, beachfront luxury villas that are sold under fractional ownership. This concept has been very popular in North America for some time. 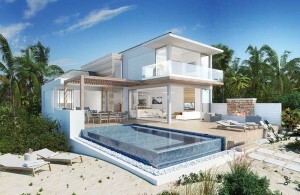 Vacation home buyers can purchase a 10% registered ownership in one of the beachfront villas. Fractional club membership offers use of a spectacular, multi-million dollar property for no less than five weeks a year, along with additional usage when space is available. This is a “win-win” opportunity for several reasons. Owners are guaranteed over a month in paradise every year, for a price tag that is commonly less than what they would spend on a single trip! It is also a chance to “test the waters” of future property ownership in the Islands at a reasonable entry level price, without having to make a big investment in a vacation property or deal with pesky maintenance issues. Buyers at Long Bay Beach Club automatically become part of Elite Alliance®, an exchange program offering a select family of prestigious residence clubs and luxurious, professionally managed vacation homes worldwide. Through a simple exchange process, LBBC members can contribute their unused weeks into a key that unlocks the door to seamless travel adventures—ski trips, golf getaways, beach escapes, and much more—at a growing array of coveted destinations. Members at Long Bay Beach Club can also decide to contribute some of their weeks to the Club’s professional property management company and enjoy rental income in lieu of personal or family use. The Club is designed to provide the ultimate level of member flexibility. Villa interiors are comfortable and calming. LBBC Development is led by Tom Cibotti and Ben Dunn, business partners for over 20 years in a Boston-based corporate advisory firm. Interestingly, Ben’s family roots include some of the earliest Bermudians who came to Salt Cay in the 1700s to harvest and export salt at the legendary White House. For over a decade, Tom has been on the board and is currently president of a five-star residence club located in Deer Valley, Utah, considered by many as the most exclusive ski resort in North America. According to Savory & Co. Senior Attorney Emma Riach (emmariach@savory-co.com), the Fractional Ordinance of 31 December 2014 introduced for the first time into TCI law the ability for multiple owners to hold separate and registered fractions in property. The advantage of such is to give each owner its own legal interest in the real property which is secured by registration at the TCI Land Registry. Additionally, the usage rights of the owners are enshrined in the registered fractional By Laws, which must set out the rights and obligations of each owner in terms of when and how they can occupy the property and effectively exercise their proprietary rights, booking systems, and their liabilities for cost sharing with the other fractional owners. Fractional ownership affords far greater security and potential investment value for people investing in “shared” ownership than the alternative of owning shares in a private company governed by a private shareholders agreement. Like other forms of real estate, this interest can be placed in a trust, sold, or willed to others. More than one family or person can own a single ownership; these joint owners can allocate their scheduled time among themselves. Long Bay Beach Club sits on 160 feet of private beach frontage on the western end of sprawling Long Bay Beach. The quiet residential neighborhood is noted for its luxury estates, while the beach boasts pristine ivory sand and has been an ideal entry point for international kite surfers, who take advantage of the steady tradewinds and unencumbered stretches of sea. Long Bay Beach was ranked among the “Ten Best Beaches in the World” by Condé Nast Traveler in 2015. Each home boasts three levels and 6,000 square feet of indoor/outdoor space with five bedrooms, private infinity pools, beachside decks, fire pits, and a yoga/gym pavilion. Its clean and contemporary Caribbean design—a creation of internationally renowned SWA Architects— focuses on family-oriented living areas on the first floor, with increasing privacy and breathtaking views from the second and third levels. The homes are surrounded by lush Caribbean foliage typical to the area, further enhancing the sense of staying at a boutique resort all your own. 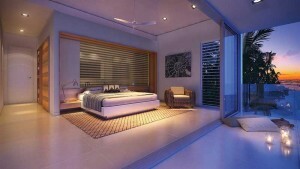 Interior design is led by DADA Associates, one of Miami’s leading specialists in Caribbean design. Fully furnished with state of the art kitchens, interiors are comfortable and calming, melding warm woods, soft tones, and nautical themes. Another benefit to being a LBBC owner or guest is the exceptional level of service offered. Each villa is staffed by a personal attendant whose job is to make your stay perfect. This includes personal airport transportation and daily concierge services. Also included are five-star resort amenities, including a gym with the latest in fitness equipment, spa and yoga services, and paddleboards and kayaks to use on the beach. The Club’s concierge will arrange scuba diving or snorkeling excursions, horseback riding outings, sailing or fishing trips, golf and tennis, or any other activities the island has to offer. At the same time, Providenciales’ vast menu of dining options, evening entertainment, and shopping is readily accessible from your villa. With construction well underway in Long Bay and villa completion anticipated in late Fall/early Winter 2016, ownership opportunities for a “piece of paradise” are rapidly diminishing! Visit www.longbaybeachclubtci.com or contact Walter Gardiner at (649) 941 4100/231 6461 or (954) 636 1426/284 4053 or email walter@tcibrokers.com.